One of my favorite Microsoft conferences takes place every spring in Las Vegas, and this year I may have an opportunity to speak at MIX11. If you've never been to MIX and you are a web developer (particularly, a "Microsoft web developer"), then you're missing-out on a great conference experience. Personally, if I had to choose between Microsoft-run events, I'd pick MIX over TechEd and PDC almost every time. It's not as big as some events, but it's high-energy, focused, and a great place to talk about all things web and design. It's a cool CSS3 talk with lots of practical tips for managing the ballooning CSS rules modern browsers offer. Picked or not, I appreciate your support and can't wait to see some of you in Vegas this April! Happy New Year! It's January 3rd, the first working day of 2011 for most of us, and a time of year when we can count on weight loss commercials to run like political ads on TV, and the Internet to collectively "predict" the major trends for the upcoming year. I don't usually blog "predictions," though I do regularly make them. In reality, posts like this are little more than "permalinks" for debates that can be pulled-out to "prove" your infallible foresight in the world of tech when you make an even marginally accurate prediction. And much like industry analysts and their expert opinions, there are few consequences for guessing wrong. So, why not. I will focus my predictions on developer related technologies and trends, especially in the Microsoft space. That is, after all, the audience for this blog, and hopefully an area I can lend the most perspective to help guide you towards the hot topics of 2011. I don't have to be much of a prognosticator to make this prediction, but there are definitely people I respect that would disagree. If you look at the wave of HTML5 browsers that will finally ship official versions in 2011 (specifically, IE9 and FF4, joining Chrome 9+ and Safari 5+), there were be a large, uniform foot print for HTML5 (and its related technologies, like CSS3) to blossom. Even the expanding usage of mobile internet will drive HTML5, as it provides the one and only "available everywhere" rich platform. I'm not predicting the death of plug-ins, but I do think they will take their battle to the desktop and leave the web to browser-driven standards. To be clear, I don't think Microsoft will overtly rebrand Silverlight, but with the release of Silverlight 5, Windows 8 beta, updates to Windows Phone, and rumored Silverlight on XBOX in 2011, Microsoft will stop fighting to "light-up the web" with Silverlight and instead focus on its benefits as a rich, universal "app" platform for Microsoft environments. Along with this, WPF will get pushed even further to the back of the bus, remaining relevant for specific types of development, but not part of the "mainstream" conversation. Microsoft will push Silverlight as "the app platform" to help reduce the WPF/Silverlight confusion that has lingered for the last couple of years and simultaneously spur developer interest in creating apps for Phone and XBOX. Windows Phone will be 4th by measure of market share by the end of 2011, driven largely by Enterprises interested in the familiar app development model and willing to give-up Blackberry for keyboard- and Outlook-equipped WP devices. We've already seen companies like Dell push in this direction (granted, they have a commercial motivation), and many others are reportedly re-evaluating their dependency on Blackberry. The powerful weapon Microsoft brings to this fight, one that Android lacks, is a mature, well-entrenched Enterprise sales team. Microsoft knows how to sell to Enterprise, so assuming the Phone can catch-up with critical features, they'll win many head-to-head battles with Google's alternative. And since I've opened the door with rankings, Android will be first, iOS will be second, RIM will be third (with a declining share), Microsoft will be fourth (with a rising share). With Windows Phone, Android (and its fracturing), iOS, Palm OS, Nokia's MeeGo, Blackberry's upcoming QNX OS, and a handful of other "device" operating environments proliferating in 2011, developers and companies are going to finally start questioning the logic in creating custom versions of "apps" for every device. Think about it. It's worse than the "desktop wars" of nearly 20 years ago that originally spawned Java and ultimately gave rise to web applications. Three competing approaches to solve this problem will emerge in 2011: 1) Tooling will attempt to abstract the platforms for developers, producing native variants of a single app for multiple platforms, 2) Frameworks, like MonoTouch, will attempt to create an abstracted runtime layer that can be deployed to multiple platforms, and 3) a push for a return the rich web browser for many app types will move some app development back to HTML5 that works on all platforms. I think options one and three hold the most short-term promise, but more on that later this year. Creating optimized versions of websites for mobile browsers today is already common for major websites, but by the end of 2011, it will be common practice for all websites. Aided by a better understanding and usage of CSS media queries, and driven by an unignorable volume of mobile traffic, web developers will be forced to provide some level of targeting for mobile devices for all websites they maintain. Ultimately, I think it will be a good year for HTML5 and Silverlight in the developer space, and that mobile (whether that's tablet, phone, or something in-between) will be a big part of the conversation. What do you think? 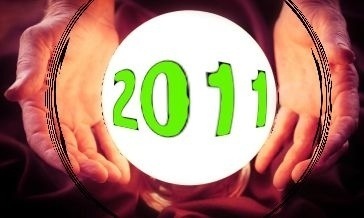 What's coming in 2011 in the developer space that I've overlooked? Speak now and claim your "told you so" link for 2012. Also, check-out some 2011 predictions from my esteemed colleagues, Stephen Forte and Joel Semeniuk.